Another nil nil draw for the Addicks, after battling Charlton survived a late onslaught at Upton Park today. It was a familiar display, with little to shout about up front, and a solid rearguard effort and workmanlike performances from the whole team. The official site match report is here. West Ham had chances through Dean Ashton after just a couple of minutes, and in the second half when Kishishev headed off the line from Zamora, and Myrhe saved brilliantly from birthday-boy Sheringham, both of the later two resulting from corner kicks. 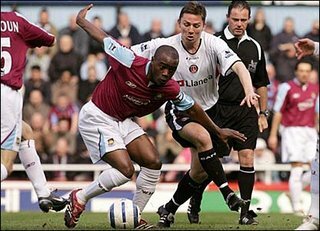 Other Hammers chances came and went without duly troubling the Charlton defence. 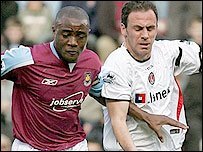 Shaka Hislop, in the West Ham goal, was not really troubled at all, apart from a Kishishev lob which bounced over the bar, and a few early snap efforts from Darren Bent. Rommedahl for Thomas was the only change made by Curbs to the previous weeks victorious team, but there seemed to be more emphasis on defence, rather than pushing forward. The midfield, and especially Kishishev ran their collective hearts out in an attempt to nullify any threat West Ham may have had, but they could provide little in the way of ammunition for either Bent or Rommedahl to feed off. At the back, Chris Perry was excellent once more, and Hreidersson and Powell also very solid. Luke Young had a good game too, although he was booked after an hour. He also went off with an ankle injury ten minutes later, and Curbs expects him to be out for a couple of weeks at least. How Charlton cope with this injury, the first major one that the Addicks have had for some time, will be interesting. Jonathan Spector came on as substitute, and did OK, but it could be that Kishishev is switched to fill this role against Everton or Middlebrough. Hopefully, Young will be back for any potential FA Cup semi-final, and the injury will not effect his World Cup chances. My man of the match went to Chris Perry, who is playing very well at the moment. He controlled the opposition forwards, and Ashton (who was substituted at half time), Harewood, Zamora, Sheringham, and Katan rarely had shooting opportunities from open play. The result keeps Charlton in eleventh place in the Premiership, and within touching distance of the top half of the table. The one booking also retains Charlton's lead in the top division Fair Play league, and this is a back-door route into Europe that Charlton would like to keep open. A good finish to the season could see Charlton rise to the heady heights of eighth, but a poor finish will see Charlton slip to thirteenth. The difference in Premiership prize money is around £2.3m, so there is plenty to play for apart from just the FA Cup at Charlton these days.